Bob is a Montana native and obtained his undergraduate degree in Forestry from the University of Montana in 1980. 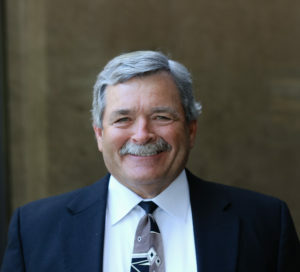 Prior to graduating from law school, Bob worked in different occupations including the Forest Service, United Parcel Service, a drilling company involved in mine exploration and as a timber cutter. Bob received his J.D. with high honors from the University of Montana in 1988. He has been with the firm since graduation. He is admitted to practice before the Montana Supreme Court, the Federal District Court for the State of Montana, the Ninth Circuit Court of Appeals and the U.S. Supreme Court. Bob is a member of the Cascade County Bar Association, American Bar Association, Association of Defense Trial Attorneys and the Montana Defense Trial Lawyers, Inc.
Bob has a diverse practice that is concentrated on defense work in the areas of personal injury, insurance claims, commercial litigation, construction defect and construction law, products liability, insurance defense and medical malpractice defense. In addition, Bob has also handled a number of cases with respect to estate and probate litigation. Bob has extensive experience in preparing and taking cases to trial, including numerous jury trials in state courts around Montana. The firm is located in central Montana and, as a result, Bob has defended numerous clients in counties all across Montana. Bob has served, and continues to serve, in a number of charitable and volunteer organizations including coaching football, basketball and baseball. Bob has also been a board member and president of several youth organizations including Little League and the North Montana Wrestlers.